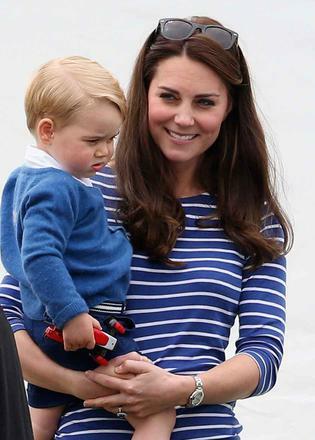 The Duchess of Cambridge in her ME+EM Breton top. Photo courtesy of Getty Images. ME+EM, the low-key yet glamorous British label, is the go-to stop for a Breton top. When the Duchess of Cambridge was pictured wearing her cobalt blue version at the Beaufort Polo Club in 2015, she put the small British brand on the map and instigated a 5,000 strong waiting list. It’s a testament to the vision of founder Clare Hornby, who ditched a career in advertising to set up the elegant yet wearable women’s clothing label in 2009. So it comes as no surprise to learn that she teamed up with Georgie Ainslie to create a piece of clothing to be worn by the female members of the Land Rover BAR team out in Bermuda. The challenge was to create something tasteful and stylish that could stand up to the uncomfortably hot conditions. Together, they hit upon the idea of remodelling the classic striped Breton top. Another influence was Coco Chanel, ultimate fan of the Breton style, known to the French as the marinière. The pioneering fashion designer used to wear the iconic striped top herself after seeing it on sailors during her seaside holidays. 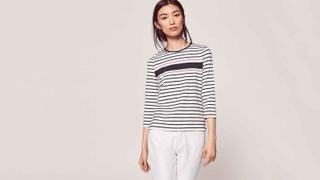 Breton top, £55, meandem.com. A percentage of proceeds from sales of the America’s Cup Breton top will go to the 1851 Trust.